Increasing the “curb” appeal, improving the return on investment and protection from the elements are just some of the benefits of mobile home siding. And while today’s mobile home siding is designed to last longer than before, there’s still bound to be times when it will need to be repaired and instances where the siding will have reached its functional shelf life. 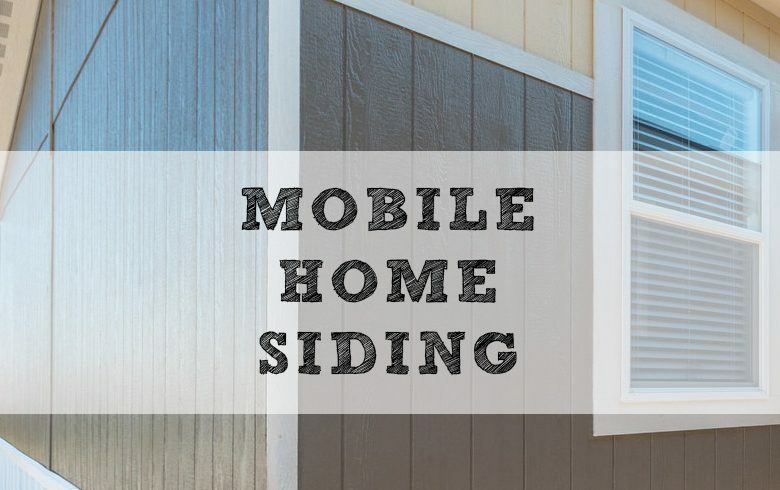 This post is designed to educate mobile home owners on the various types of mobile home siding, how to select the right siding and how to install it. Vinyl: Vinyl has fast become one of the most popular siding styles on both single-family homes and on mobile homes – and for good reason. For starters, it’s available in different types (i.e., insulated and non-insulated, hundreds of colors to select from, etc.). It’s also an affordable option with a high resell value. What’s more is it’s a sturdy material, able to withstand winds in excess of 100 mph, and most manufacturers offer generous warranties to ensure it’s a long-term siding solution. In terms of drawbacks, it’s not always water tight, so water can seep in between cracks and do damage to the structure if it’s not installed correctly or if a waterproof layer isn’t installed beneath it. Finally, vinyl isn’t prone to distortions and warping during periods of hot weather. Fiber Cement: Though the big disadvantage of fiber cement is its comparatively high price as opposed to other mobile home siding materials, it does have an attractive laundry list of benefits to boast. The fact that it’s available in various different sized boards and thicknesses is a big benefit, as is the fact that it can mirror the look of other types of siding on the market. It doesn’t rot, is very durable and most manufacturers offer extended warranties against fade, color reduction and finish. Though installation is a bit more complex, it can be installed both vertically and horizontally. Wood: Many mobile home owners love wood for its natural, rustic look – and that’s the big benefit of going with wood siding, it looks great. There are a few different variations of wood siding. There’s T1-11, or plywood, which is a 4 x 8-foot grooved panel that can be installed either vertically or horizontally on a mobile home. Cedar siding is also available, and in addition to a more rustic look, cedar is also more moisture-resistant than other types of wood. Cedar also happens to be a natural insect repellent. Wood is great for the hands-on mobile home owner who is up to maintaining it. That’s because some of the key drawbacks to wood siding is that wood is prone to rot and decay, and some types are more welcoming than others to insect infestations. Aluminum: Aluminum is affordable, lightweight and fairly easy to install. It can also be painted, and is considered a tried-and-true siding option on said homes as it’s a material that’s been successfully used for decades. One of the main drawbacks about aluminum siding is that it can dent. Stone: The big pros of stone – whether it’s real or manufactured – is that it looks great and offers superb energy efficiency properties. However, it’s an extremely heavy material and it’s also very intensive to install, making it difficult to DIY and expensive to have it professionally done. It’s also worth noting that many mobile home users have been combining siding materials to create more of the look they want. For instance, one such option would be to use vinyl as the main siding material and then use wood siding to accent it. Budget: First and foremost, there’s the all-important aspect of cost. Each siding type listed above is priced differently, so owners have to decide if their budget will support something affordable and adequate, like aluminum or vinyl, something high-end, like stone or fiber cement, or something on the low end, like wood. Weight: Weight is an important siding consideration both when it comes to a mobile home’s structural integrity and when it comes to transporting said mobile home. For instance, if you plan to move your mobile home after new siding has been installed, the weight comes into play when it comes to transporting it and if any reinforcement should be administered for safe transportation. Transportation aside, too much excess weight can also cause eventual imbalance and structural issues. Vinyl and aluminum are lightweight siding types, whereas fiber cement board and stone are heavier styles. Weather: Another consideration when it comes to selecting siding is the type of climate the home is located in. For instance, if you live in an oceanside or lakeside environment that’s susceptible to high winds, it’s wise to select a siding type that can withstand them. Vinyl, for instance, is designed to withstand winds up to 115 mph. Ease of Installation: Are you contracting for siding installation or do you plan to do the work yourself? If you’re doing the work yourself, we’d recommend selecting a material that’s easier to work with, like aluminum, vinyl or wood. Stone and fiber cement tend to require a more extensive installation. 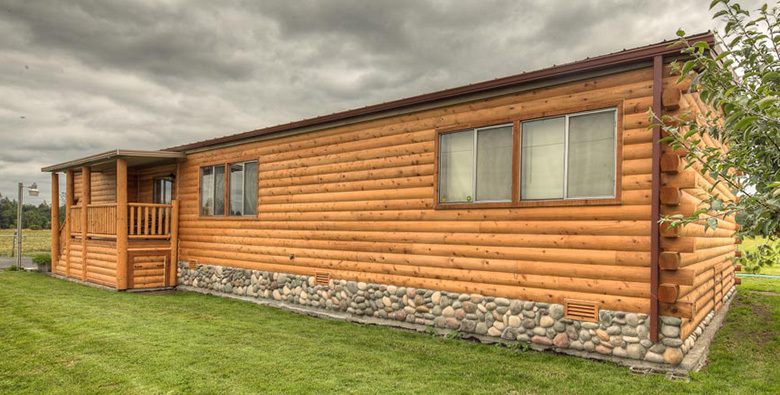 Return on Investment: As we mentioned earlier, one of the big benefits to new mobile home siding is that it can add resale value to your unit. Noting this, the investment of new siding can pay off big time if you go to sell it. 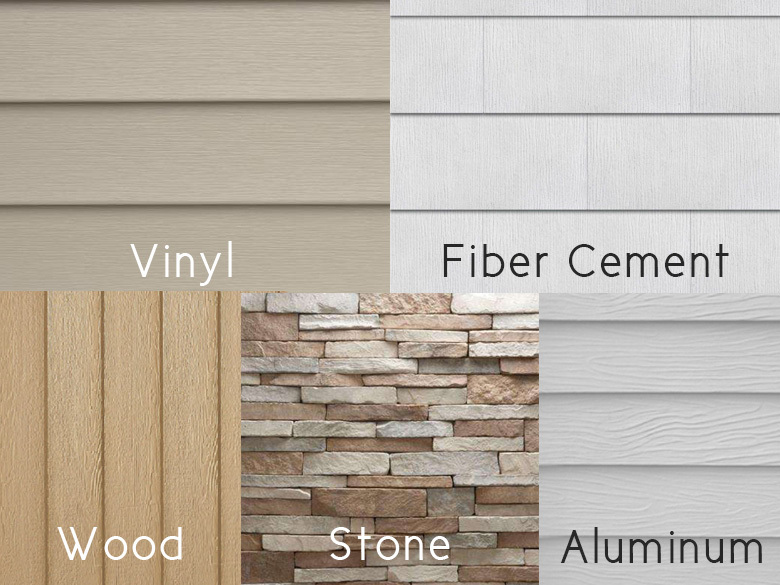 Fiber cement siding tends to yield the best ROI, with vinyl coming in a close second. Energy Efficiency: Finally, there’s the aspect of energy efficiency when it comes to siding. Some siding can act as insulators and really help mobile home owners save money on utility bills. Stone happens to be one of the best insulators, but vinyl is good too. Mobile Home Siding: To Replace or Repair? Attractiveness: Is the exterior of the mobile home aesthetically pleasing? If not, it likely has a lot to do with how the siding looks. Now if the siding looks worn, discolored or faded, don’t go getting estimates on replacement right away. That’s because some materials, like aluminum, can be painted. 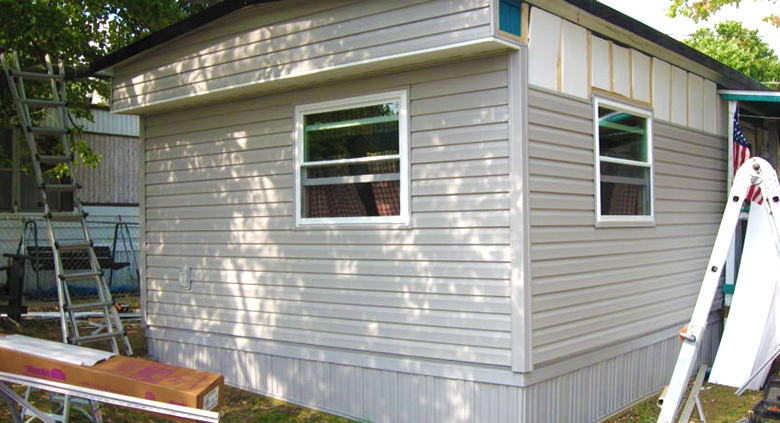 A fresh coat of paint on some siding can really liven up the attractiveness of the overall mobile home unit. If the siding appears overly dirty, power washing it can do the trick. Condition: Attractiveness is one thing, condition is a whole other thing. A dent, some rot or a hole here or there is no big deal – and therefore repair over replacement is likely the best course of action. However, if the issues are widespread, then replacement is the better option. When it comes to both attractiveness and overall siding, it’s important to check with the manufacturer’s warranty before you schedule any repairs or replacement. Like we told you earlier, many manufacturers offer 10- or 15-year warranties on things like fading and discoloration. Some manufacturers also offer 25- to 50-year warranties on longevity. Is Mobile Home Siding a DIY Job? Prep the job: After removing any existing siding, scrape away any old caulking, particularly around windows and door frames. Be sure to also remove any gutters, lights or other exterior installations if they interfere with the siding. Before administering the siding, you may also choose to put down insulation to help improve energy efficiency. Be sure to check with the siding manufacturer before doing so, as it’s not advised for all types of siding, vinyl or otherwise. Cut the corners: Measure and cut a corner post, allowing for about a half-inch gap between the top of the post and eave of the mobile home. Install the corner post with a nail about every foot. Find the lowest part of the home and make a chalk line about a half-inch from the very bottom of this low point. Trace the chalk line all around the mobile home, ensuring that the line is straight and even throughout. Lay the siding starter strip on the chalk line and hammer in a nail about every 10 inches. Cut the first piece of siding and install it over the starter strip. Continue with each subsequent piece of siding until the mobile home is complete. Make sure there’s a gap of about one-eighth of an inch with each piece of siding to allow for overlap. Also, you should be leaving about a quarter-inch gap at the corners, as the siding is designed to tuck into trim pieces to hide the cuts. Trim Flashing: Flashing, or trim pieces, should be installed around windows. These pieces must be cut with a mitersaw and should be done so that the channels are wider than the window itself. These should then be secured all around the window. Repeat for doors as well. Mobile home siding can be purchased at the likes of hardware stores and some department stores. However, for the best advice on what mobile home siding is best for your unit, based both on your personal preferences as well as the climate you live in, a specialty mobile home supply store can offer the know-how and personalized customer service that can help you make the best decisions. We do not provide any local on site repair services. We just offer advice for those who do the work themselves or for pro’s who may not be familiar with mobile homes. Please consider using a repair directory such as Angie’s List to find a qualified repair company. Best of luck to you!